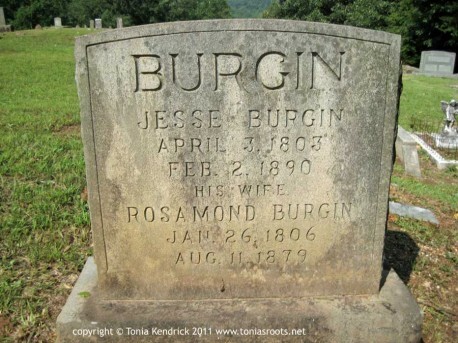 Jesse Burgin was born 3 Apr 1803 and died 2 Feb 1890. His wife, Rosamond Burgin, was born 26 Jan 1806 and died 11 Aug 1879. They are buried at Bethel UMC-Old Cherry Springs Cemetery in Old Fort, North Carolina. I believe that Jesse and Rosamond were first cousins, but I haven’t proven that yet. Jesse’s sister, Malinda (Burgin) Hemphill, was my 4th great-grandmother.